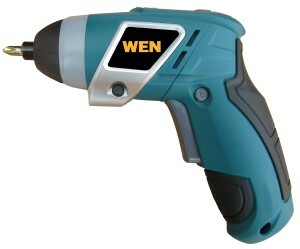 Due to their nature, best cordless screwdrivers have recently become very popular. With their help, one has the possibility to perform a lot of repairs with little effort. Thus, it’s not surprising that these tools can be found not only at construction sites, but also in average households. Best cordless screwdriver comparison table. 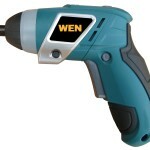 Independent detailed review of best cordless screwdrivers. Features to consider before buying a cordless screwdriver. How to find your best cordless screwdriver. DEWALT DCF610S2 is perhaps one of the best cordless screwdrivers you can get in the market today. According to the majority of this cordless screwdriver’s reviews, its compact design, together with a powerful 12 Volt lithium-ion battery makes it a perfect tool for both professional and DIY jobs. Its weight of 2.2 pounds, distributed evenly within the screwdriver’s body, makes it easy to handle and maneuver in tight places. Its engine produces a 160-unit-watt output, providing maximum leverage for its ¼ inch chuck which accepts bits of up to 1 inch. It also comes with multiple torque settings, variable speeds, and a reverse option. This screwdriver is also equipped with plenty of user-friendly features, such as three radial LEDs, a one-hand-loading option, and a built-in belt clip. In the box, one will also find an extra 12-Volt lithium-ion battery pack and a charger. The latter is able to refill an empty battery within 30-60 minutes. Its ultra-compact design combines with a wide range of clutch settings and provides convenience and precision to plenty of drilling, driving, and assembling tasks. 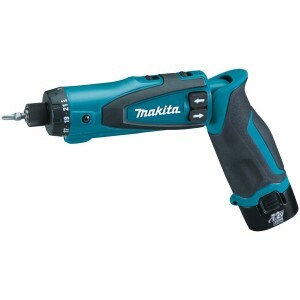 The DF010DSE is equipped with a Makita-built motor delivering 44 in/lbs. of max torque in drilling mode. Depending on the gear, one can get either 200 RPM or 650 RPM. Additional versatility is reached by changing the operational position from pistol grip to straight. The 7.2 Volt lithium-ion battery, equipped with a low battery indicator, ensures long operating hours while the auto-stop function prevents over-driving when the clutch disengages. The cordless screwdriver reviews show that this model, with its weight of 1.2 pounds, is probably one of the best cordless screwdrivers for long-lasting tasks. 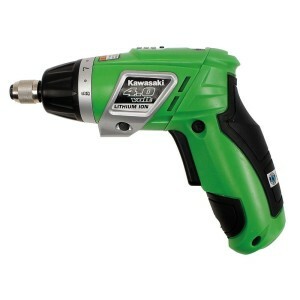 This screwdriver from Kawasaki is a 4 Volt dual angle quality tool which is quite popular among DIY consumers. Even though not many professionals would use it, it still can cope with most DIY tasks. Its engine delivers 27 in/lbs. of torque while its only gear comes with 200 RPM. Its auto spindle lock and low battery LED indicator add extra comfort for its users. Its weight, quite competitive compared to other models, comes up to 1.6 pounds. Its lithium-ion battery copes with most tasks perfectly. An extra battery is not provided however. In most of the cordless screwdriver reviews, this model is suggested as one of the best cordless screwdrivers for amateurs. According to cordless screwdriver reviews, this 3.6 Volt lithium-ion screwdriver, equipped with a magnetic screw holder, is considered to be one of the best cordless screwdrivers for around-the-house jobs. With an engine delivering 70 inch/pounds of torque at 180 RPM, it’s absolutely irreplaceable for assembling and installing furniture, laying electric cables, and many other domestic tasks. LI4000 also includes a built-in LED which provides visibility, a reverse option, and Smart Select technology making the process of torque selection easy and quick. In the box, one will additionally find a charger and an 11-piece accessory set. No extra battery pack is included. A powerful 4 Volt palm-sized device, the 2354-02 iXO is a great choice for homeowners. Its low speed provides higher torque, which helps to avoid screw stripping and surface damages. According to cordless screwdriver reviews, its lithium-ion battery holds charges for up to 18 months, which makes it very convenient to have in the back of your vehicle, for example. One of its key features is its right angle attachment which helps its users to deal with hard-to-reach places. Convenient controls, rubberized handle, forward and reserve LED indicators together with a trigger lock and automatic maintenance-free LED Site Light make this model one of the best screwdrivers of its type. The box contains a charger and a five-bit set. cordless screwdriver reviewers call this device a cleverly designed convertible tool. Its minimalism combines with 34 inch/lbs. of torque, making it reliable and convenient in many around-the-house situations. 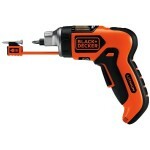 Extra features include a LED light and a magnetic bit. It’s light, convenient, quick, and durable. The box contains the charger and the bits. The Craftsman Evolv 3.6 volt screwdriver comes with a torque of 27 inch/lbs. and 200 RPM, which is usually enough for most household tasks. Its ergonomic soft-grip handle provides perfect control while the NiCd battery has a good level of durability. Cordless screwdriver reviewers nominate this model as the best combination of quality and price. Designed for different levels of expertise. Cordless nature provides maximum portability. Battery power makes it independent from a stationary power supply. Multifunctional, allowing its owner to perform various repairs and assemblies. Lightweight and compact, fits into tight areas and easy to operate. Still, when it comes to choosing the best cordless screwdrivers, you may face an unexpected trouble. The modern market offers an overwhelming amount of different brands and models. This is quite confusing, especially for non-experts. Preliminary research is absolutely necessary in such a case, and going through some cordless screwdriver reviews may be a good idea. In order to find the best cordless screwdrivers, it’s vital to specify the features you expect your future tool to have. Choose only those functions you plan to use. Select a brand and model. Remember, the most popular brand does not always guarantee the best cordless screwdriver. Pay attention to the batteries. The type of metal used in the battery is important. An extra battery pack is vital as well. Research the materials. 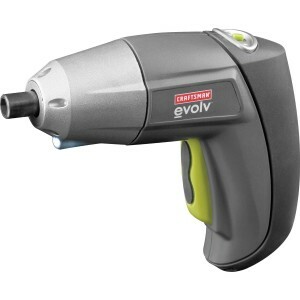 Nowadays, according to many cordless screwdriver reviews, there are plenty of materials that add a lot to the grip and ergonomics of electric devices, which is definitely a must-have feature for modern tools. 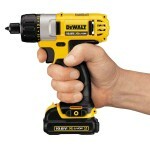 Use our cordless screwdriver review. 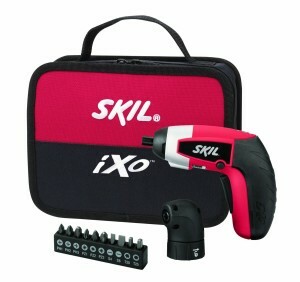 Further down in this article, a review of the top 6 best cordless screwdrivers will be presented. Take a look at the pictures, ratings, and prices, and read through the product details and tool characteristics. There are many bloggers who write reviews on cordless screwdrivers and share them via social networks. You may find these useful as well. Read the product information carefully. The brand, model, type of materials used, manufacturer – everything is important. It’s easy to surf through dozens of web sources within a short period of time. As a rule, they are customer-friendly and you are likely to spend less time getting the product you need. Do not forget about sales and discounts. 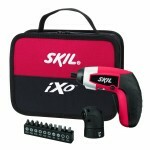 Quite often, the best cordless screwdrivers and other extra equipment for them can be bought for a reasonable price. Also check our my review of best laser levels and best soldering iron reviews.